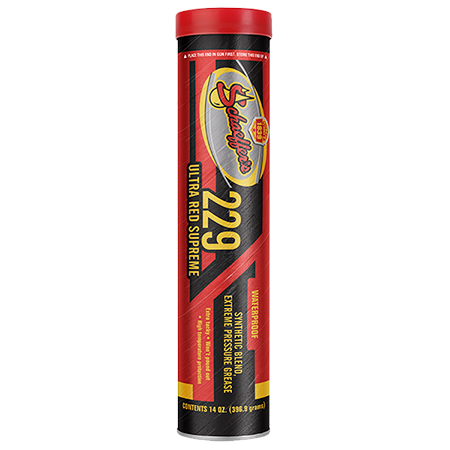 Ultra Red Supreme is a multi-purpose, extra tacky, aluminum complex, waterproof grease made from severely hydrotreated polyalphaolefin (PAO) synthetic base fluids and a high viscosity index solvent refined, severely hydrofinished 100% paraffin base oils. Designed for durability, Ultra Supreme withstands the demands of heavy-duty automotive, industrial and off-road equipment. Ultra Red Supreme quickly plates to metal surfaces, offering solid, reliable protection that lasts longer than conventional greases. During periods of excessive pressure, increased heat and high shock loads, this grease resists breaking down and shields bearings from wear and tear. Fortified with moly, which allows the grease to act as a backstop, Ultra Red Supreme Grease significantly reduces friction, which reduces wear and contact area temperature. This in turn leads to increased equipment life, less downtime and extended lubrication cycles. Ultra Red Supreme is red grease for use where a clean grease is needed. Not recommended for use in passenger car automotive wheel bearings and electric motor bearings. Waterproof grease resists emulsifying, washing out and spraying off when exposed to moisture.